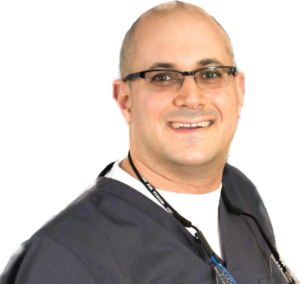 Here at Crownsville Dental and Wellness Solutions, we spend a large amount of time keeping up with industry trends. Almost daily, I hear the term 3D printing used by patient when we discuss repairs to damaged portions of their teeth. Due to my many conversations daily with patients about modern dental treatments, I dipped my baby toe into the waters of 3D printing and bought an inexpensive printer. The idea is to learn about how 3D printers work and how they interface with our existing computer systems. Our initial experimenting with 3D printing will allow a more seamless integration into our current work flow when a medical grade printer come along that is relatively affordable. Our long term goal is to bring a printer into the office, so we can make more components in-house as opposed to sending to another location for printing. Applying 3D printing to patient care is a rapidly growing part of dentistry and also one of the most fascinating. Here are the current uses for 3D printing in dentistry and a possible future use. The most useful application for 3D printing in dentistry currently is in making models of the teeth from a digital scan. We are seeing more accurate modeling of a patient’s teeth with which we can perform many tasks, from studying the position of teeth to placing a dental implant. We perform an image capture of the patient’s teeth with a dental specific camera and software. Capturing the patient’s teeth digitally has been very well received by my patient’s, primarily because they hate impressions. I don’t feel that any patient has ever remarked that they preferred the feel of a mouthful of impression material versus the camera used for imaging the teeth. Once we have a digital file of the patient’s teeth, we then send the data to a facility and have the 3D printed part manufactured. It then shows up by mail in a few days. The modes are quite accurate- at least as accurate as the stone models we were used to using in the past. 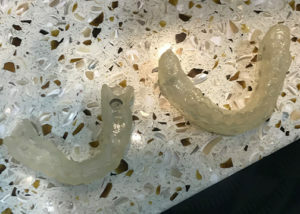 The plastics used are also stronger than the stone models we are used to using, so we have less problems with the model teeth fracturing when being used for bite checks or if we drop them (Gasp!). 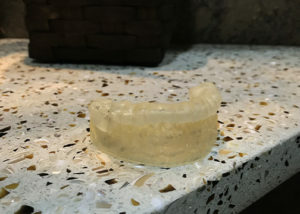 We can make bite guards for patients who grind off of the 3D files that fit very well. 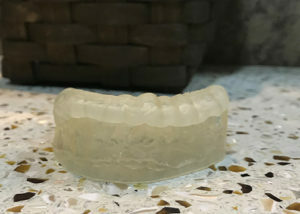 Many dental labs are turning out great bite guards quickly with the digital files. One very useful application is to fabricate very accurate placement guides for non-surgical placement of dental implants. Traditional implant surgeries are performed by peeling the gums off the chosen location for the implant and then placing the implant into the bone. With implant placement guides, we do not peel back the gums and can place the dental implant very accurately. Guided placement results in much less pain as the cutting and peeling back of the gums is the main source of pain after a surgical dental implant procedure. These plastic 3D printed guides are a revolution in terms of comfort and safety while placing dental implants. The plastic materials used are great for removable options, however, they are also the reason that we do not use them for permanent repairs that are permanently bonded into the teeth. The materials we use on teeth are made from either light hardened resin with glass particles or pure ceramic. Neither of these materials can be 3D printed currently. I feel that printing in resin or ceramic is a problem that will be solved in the not too distant future. It would be so cool to actually have a machine print a filling directly into a tooth. As technology improves dental care, newer technologies make treatments easier and quicker. Our patients can be assured we will be studying industry trends and staying current with the best available treatments.